Jammu, Jan 30 (KNS): Chairman Peoples Democratic Front (PDF) Hakeem Yaseen has urged the Governor administration to concede to the genuine demands of Agriculture department, including removal of pay anomaly, who have come on roads to seek redressal of their grievances. He has also sought regularization of the services of NHM employees and Anganwadi workers in a phased manner. 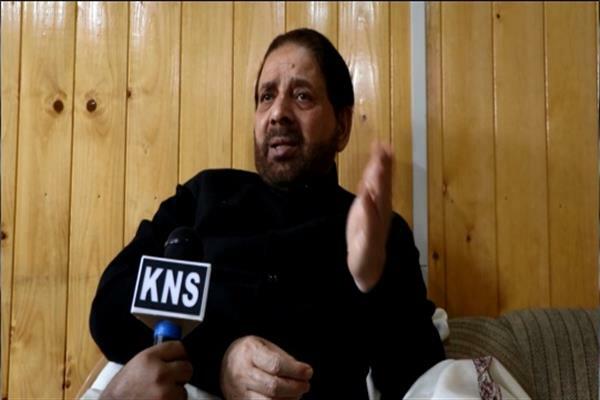 In a statement issued to KNS, Hakeem Yaseen has said that employees of agriculture, NHM, Anganwadi workers and SSA teachers have been compelled to come on roads to seek fulfillment of their long pending demands which is badly suffering government functioning in these departments. He said about 9000 NHM employees are on roads to press for their demands since last 15 days which has badly hit the patient care in hospitals of the state. He said that about 9000 NHM employees have been working continuously since 2005 on contractual basis and are uncertain about their future. He has urged the Governor administration to formulate a broad based regularization policy for their job security, financial security and social security. “It was sheer injustice that an employee despite giving prime 10 years of his life to a system is not regularised and has no job security in future, Hakeem Yaseen observed while urging governor S P Malik to meet the genuine demands of NHM employees. He said Governor should device some viable policy for regularization of the NHM employees in a phased manner who comprise qualified doctors and technical manpower .He said NHM has been doing a commendable job in bettering health care system in the state which has been acknowledged even at national level. “Likewise, Governor Administration should meet the genuine demands of the employees of the Forest department and Anganwadi workers and SSA teachers who are on roads for long time to highlight their grievances. He said previous governments have always ditched these workers by giving false promises about redressal of their grievances but left them hay and sundry after exploiting them for political gains. Hakeem Yaseen said that Governor administration being apolitical, should now come to the rescue of employees and workers of these departments and meet their genuine demands on priority bases to end their demonstrations on roads which has badly hit functioning in these departments.